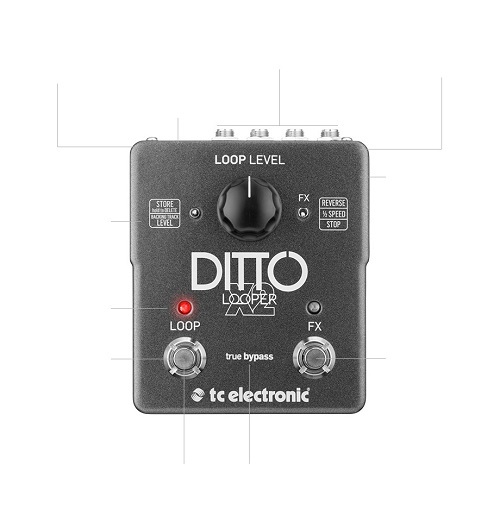 Loop Import/Export and Backing tracksDitto X2 is the natural evolution of Ditto Looper. We’ve listened to all the feedback we’ve had from happy Ditto users and carefully selected a handful of amazing features that are designed specifically to take your looping to the next level. Ditto X2 is for when you want to get serious about looping, but without sacrificing that signature-simplicity that guitar players know and love from Ditto Looper. Oh, and speaking of nice and easy – TC Electronics collaborated with JamTrackCentral to give you a package of some of the best backing tracks available. The tracks are expertly recorded, feature solos by top guitarists and – best of all – they’re free of charge when you buy a Ditto X2!